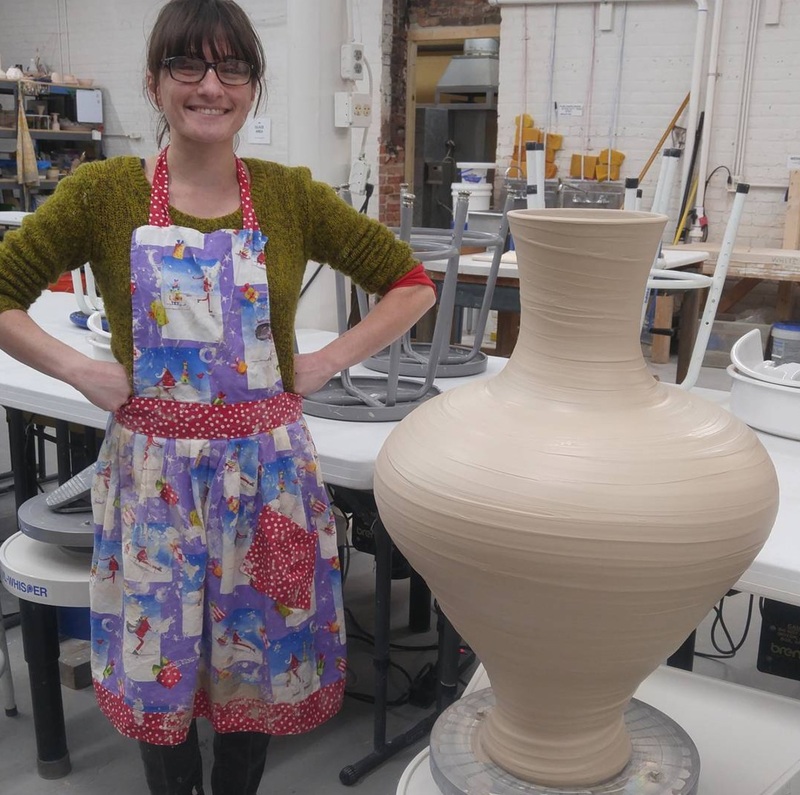 The Village Potters is pleased to feature the amazingly dedicated and talented, Tori Motyl, for our 17 Questions series. Tori also happens to be one of our studio apprentices who we have been fortunate enough to work with since spring of 2016. We hope you enjoy getting to know Tori! Clay makes me feel connected to thousands of years of human culture. What about clay resonates with you that drives you to choose this unconventional life path? Pottery seems a very peaceful and mindful endeavor. I would argue that it is only with modern standards that learning a skill that is directly connected to humans’ daily lives, such as making the cups and bowls and plates that are so important to facilitating eating, is considered unconventional. Tell me two things about your family? I grew up in a traditional Greek American family, and I consider my nuclear family now more of a pack than a family, with 3 cats, 1 dog, and 2 humans. When are you most at peace in your creative process and why? (Or) What part of your process brings you the most joy? I enjoy the time I spend drawing and making lists of pieces I want to make. I like creating lists of items that I think would display well together, or that complete a set in one way or another, or that push my current work in one direction or another. This stage in my production process is always the most hopeful and exciting because I haven’t faced the realities of construction and all the hiccups that accompany pushing your work forward. What time of day do you most enjoy creating? Describe it. Early morning when the sun has just risen and the fog is still on the mountains and I have the whole day in front of me. I like finishing my work around noon or early afternoon, I feel a great sense of accomplishment breaking for lunch knowing I have a large collection of pots fresh off the wheel. Does this path as a ceramic artist ever scare you? What part? I worry about the next sale. When will it come? 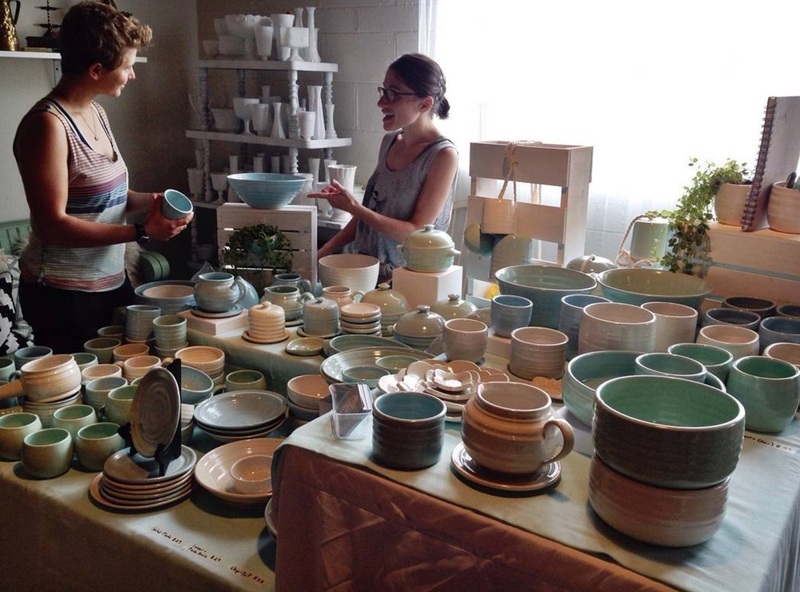 Should I sign up for a retail show or look for a new wholesale account? What if the sales stop? Will I know why and be able to redirect? A mentor told me once that she had been making pots for 30 years and she had sold every one. Whenever I feel anxious, I just remind myself to make pots, and trust they will sell. So far it’s worked. Do you consider yourself a driven person? What drives you? Absolutely. Mortality drives me. I think most of what we do in life, have children, be good to those around us, try to be a master in our chosen field, is an attempt to conquer death, to matter or have an impact that is greater than our time on earth. I want to impact the ceramic world in my time, to be an integral part of the long history of potters that have come before me and will come after me. Is there a spiritual element to your creative process? No, I strive to be a pragmatic human. Artists are always into something “exciting and new”? So what is the “new thing” in this season for you when you get up and go to work? Pudding! I love making thick slip and spreading it on a thrown vessel as it turns of the wheel and watching it drip and undulate so it looks like pudding on my pots. When you say you are an “apprentice” what does that mean to you? Being an apprentice is about keeping those who came before you alive. The unbreakable chain of master and apprentice ensures that traditions and techniques are not lost. Someday I will have an apprentice and through that apprentice, my masters, and their masters, and so on, will be honored and remembered. Share the most significant thing you have gleaned while working as an apprentice at The Village Potters? As a person I have always preferred to do things on my own. As a student I always preferred solo projects to group projects, as an athlete even through college I gravitated towards independent events like gymnastics and diving rather than team sports. Even though I grew up in a supportive and extended family, I have always just preferred to fail or succeed on my own actions alone. Working at the Village Potters has been an immersion in a life of community down to the simplest act of asking for help when flipping a particularly large slab or lifting a larger amount of clay than I can manage alone. 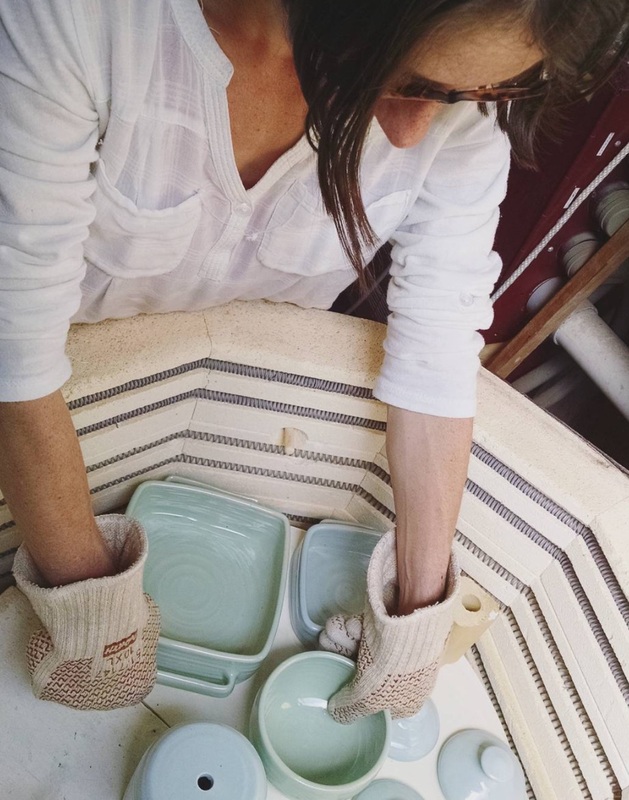 I am still internalizing this experience but I already know it has a great significance on how I will view my life as a potter. Who has been a significant mentor in in your life? 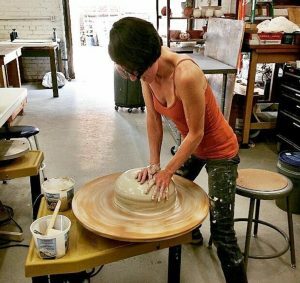 That person that you feel has encouraged you to be this kind of risk taker, a creative, a potter? I have three people who are at the head of a long line of supportive and encouraging people in my life. My mother, my father, and my brother. They have been training and supporting me becoming a potter since before I knew it’s what I wanted to become. My mother has always been incredibly organized and smart with finances. She gave me my love for spreadsheets and to-do lists. My father is a small business owner and modeled for me the work and dedication and time that must be invested to run a successful business. My brother has always supported me and being older and wiser, has at every turn offered his valuable advice and support for all things business related and beyond. 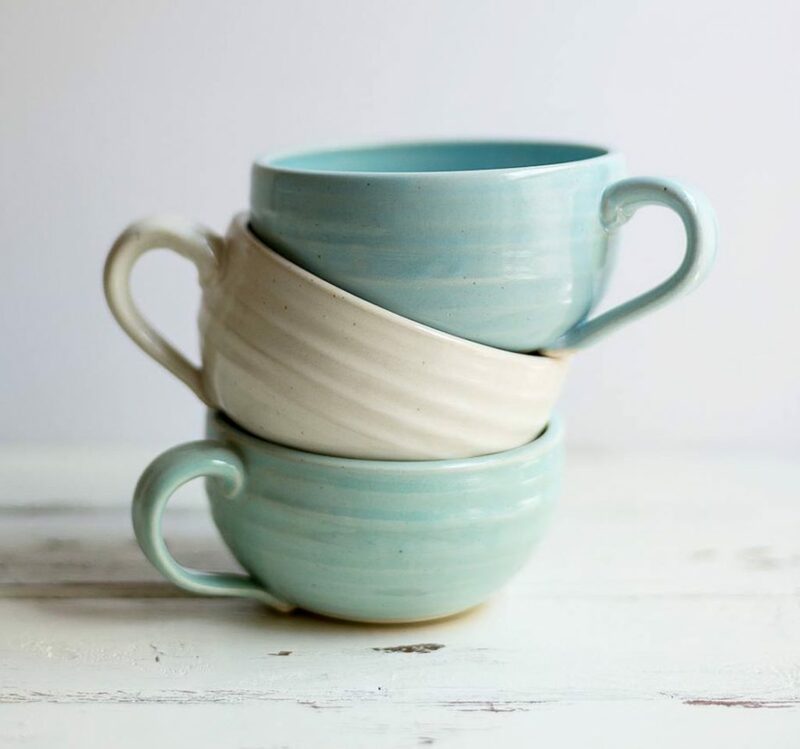 Pottery links us to the multitude of generations and culture who have come before us making and utilizing pottery as an important component of diet and society. It is a link to our past and retains that cultural and historic value long after manufacturing can make pottery faster and cheaper than a studio potter. Share something about your work that speaks of who you are? I make work that is meant to feel clean, mindful, and soothing. Perhaps that isn’t who I am all the time, but it is who I wish to be. What about the business part of your life? How do you marry business with your creative process? I love the business side of my work. Running numbers and making equations for production speeds and costs is something I do to relax at night before bed, seriously. To me there is no division between the “creative” process and the rest of my business. It is all interconnected aspects of the life I have chosen for myself. What do you want to say to those people who buy your work?